The People’s Garden Initiative and Keep America Beautiful are asking Americans to join us in supporting local ecosystems by planting species native to their area this fall. The first ever National Planting Day will take place on Saturday, September 8 and will continue with activities happening through November 30. Fall is widely considered the best time of year to plant native species of trees, shrubs, grasses, vines and perennials. The term “native” refers to all species of plants naturally occurring, either presently or historically, in any ecosystem of the United States. You can conserve water, protect soil from erosion and create habitat for wildlife simply by planting native species. A native plant garden also can supply a community with beautiful flowers, and raise awareness about the importance of protecting and restoring local ecosystems for future generations. We’re calling on People’s Gardens across the country to participate in National Planting Day. If your People’s Garden is planning a planting event, register it here. Community groups, businesses and individuals can register planting events too. Spread the word! Tell your friends and family about the importance of native species, and get them involved in National Planting Day. Learn more at www.getgrowing.org. Start a native plant garden in a highly visible location in your community. This garden can be a demonstration garden, promoting the beauty and function of native plants to your neighbors. National Planting Day is a great opportunity to include students in schoolyard greening events where students not only learn about flora native to where they live but become active in a community project. Want to lend a gardening glove? Join a volunteer effort to beautify your community during National Planting Day. 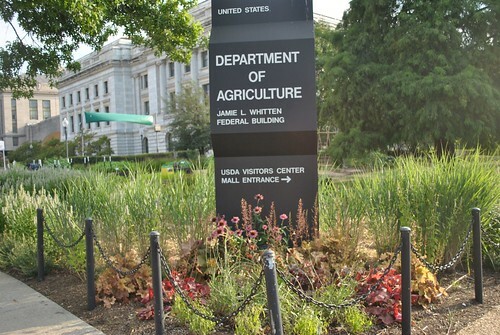 The landscape outside USDA Headquarters has been redesigned with a focus on sustainable landscape practices. The removal of invasive plants and inclusion of a wide variety of native species has created a more beautiful and environmentally friendly space. For a community garden to receive the designation of a ‘People’s Garden’ it must meet three criteria: The garden must 1) benefit the community, 2) be a collaborative effort and 3) incorporate sustainable practices such as planting native species. If yes to all three, register your garden at http://www.usda.gov/peoplesgarden and request a free sign to show your support. Hope to encourage others to plant something this fall. It's good to see this article. Thank you for promoting native plants and National Planting Day! PLEASE correct your definition of a "native" plant. A native plant is one that is known to have been in an area for hundred or thousands of years. In the Midwest, we refer to native plants as those that were recorded to have been here prior to European settlement, or over 400 years ago. Your definition "naturally adapted to growing conditions" is the definition of a NATURALIZED PLANT, not a native plant. Do you have a list of native vegetables for fall? Our garden is having a planting day on the 9th but not sure if any are "Native"
I am surprised that you don't use the definition of native provided by the Federal Native Plant Conservation Committee: "A native plant species is one that occurs naturally in a particular habitat, ecosystem, or region of the United States and its Territories or Possessions, without direct or indirect human actions." Elizabeth: The truth is that there are hardly any native vegetables. Even the three sisters that Native Americans grew (corn, squash and beans) are not truly native. They were first cultivated in Mesoamerica and brought farther north hundreds or thousands of years ago. You may find some lists of edible native plants by region, for instance: http://www.nwplants.com/information/edible_medicinal_poison/edible.html. But this isn't much. When it comes to vegetables, my commitment to wildlife consists in not using pesticides or other chemicals and not introducing species that may become invasive. In the meantime, I wouldn't dream of giving up my tomatoes. Would you?